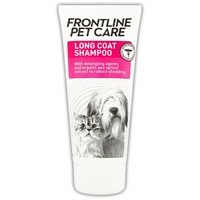 Frontline Pet Care Long Coat Shampoo has been specially formulated for long-haired dogs and cats to help strengthen and protect their coat, and aid grooming. The Shampoo contains an organic pea sprout extract to stimulate hair growth and reduce shedding, and detangling agents for a slick, snag-free combing. A long coat shampoo that actually makes grooming easier - genius!